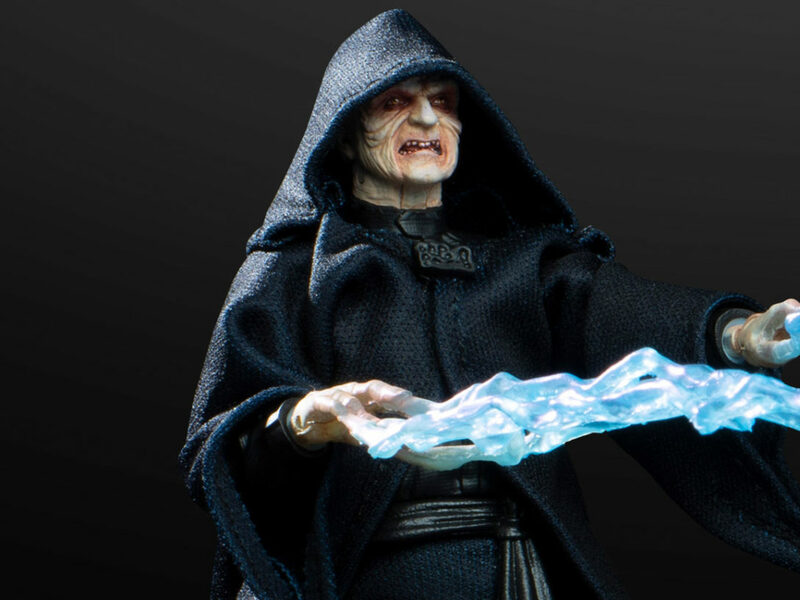 Get a first look at a new figure based on a classic Sideshow statue. 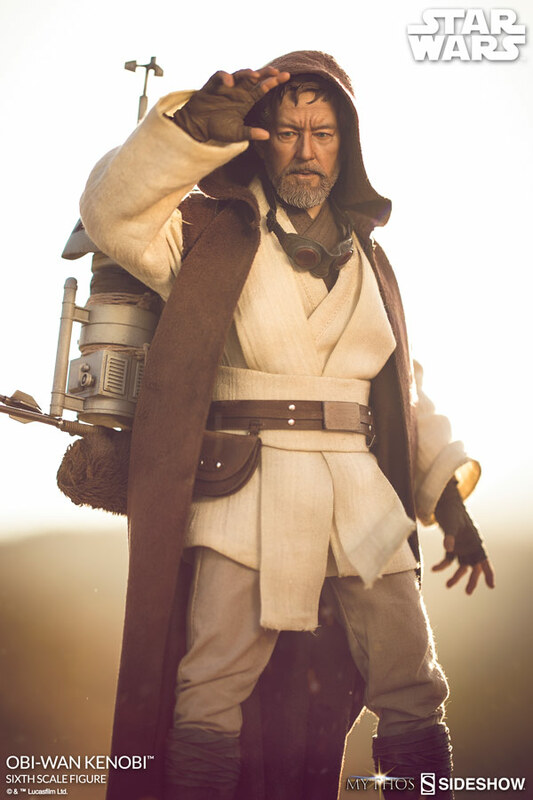 Sideshow Collectibles’ long-sold-out Star Wars Mythos Obi-Wan Kenobi statue — imagining the Jedi Knight between trilogies on Tatooine, complete with desert-traveling gear and some cool surprises — was an instant hit with fans and remains a highly sought-after item. Well, Mythos Obi-Wan is ready to strike back. 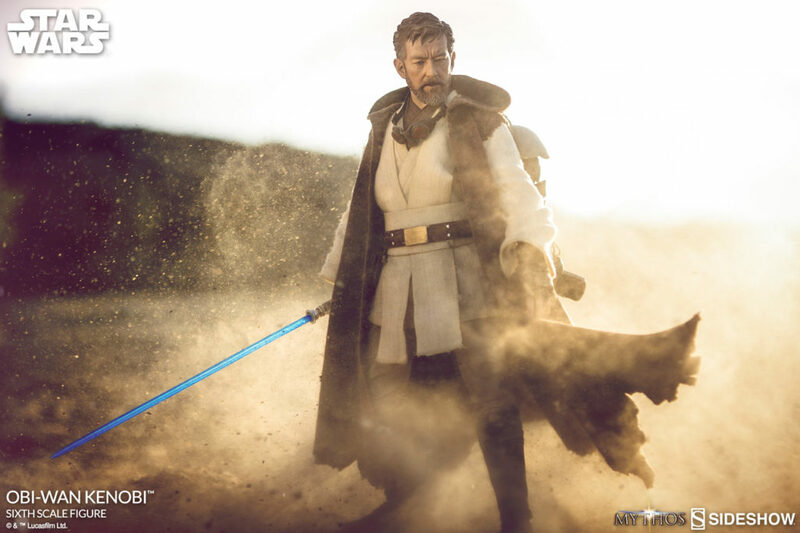 StarWars.com is excited to reveal the 1:6 scale Star Wars Mythos Obi-Wan Kenobi figure, a beautiful adaptation of Sideshow’s classic statue into figure form, which kicks off the return of the Mythos line. 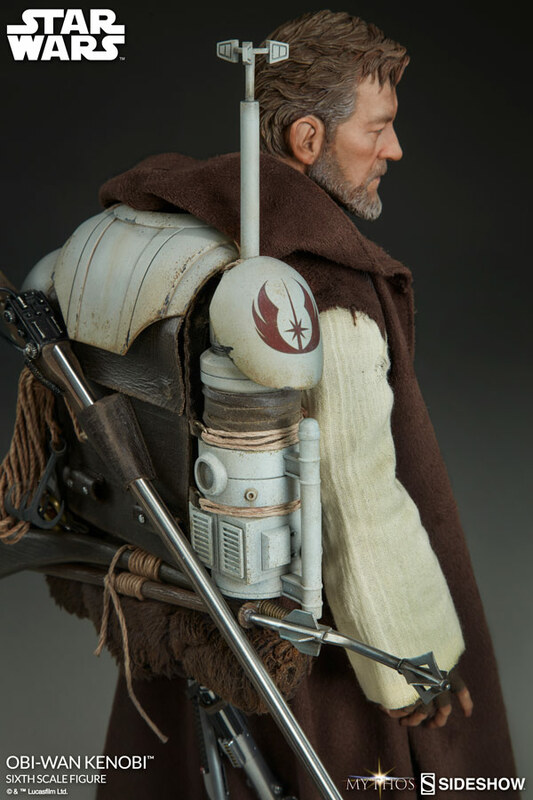 It’s filled with the same smart details as the statue, from Clone Wars armor atop Obi-Wan’s backpack to Anakin and Qui-Gon’s lightsabers dangling below, and is just as impressive a design. You’ll be able to see it in person at New York Comic Con, October 5-8, at the Sideshow booth, #1912, and can pre-order beginning September 21 at sideshow.com/obimythos. 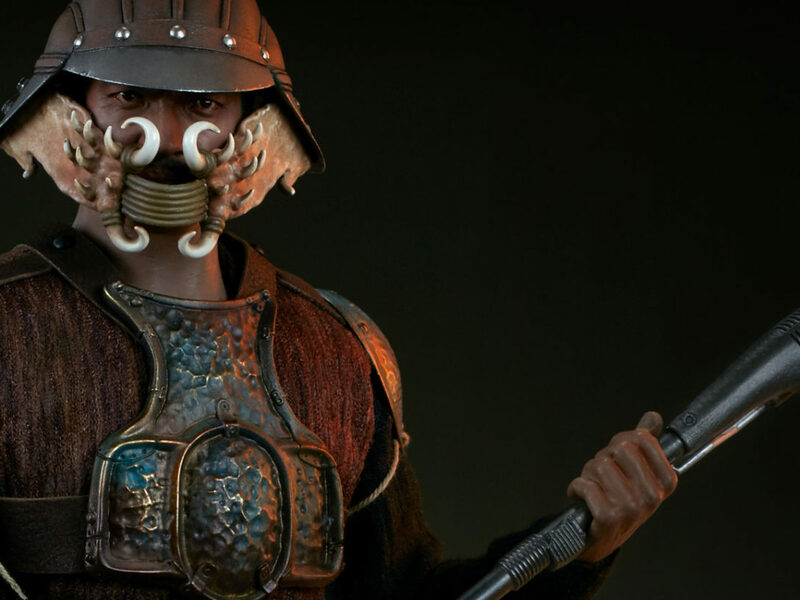 StarWars.com e-mailed with Kevin Ellis, project manager for Sideshow’s 1:6 scale series, to discuss how the figure differs from the statue, telling a story in figure design, and the clever way they approached this new head sculpt. 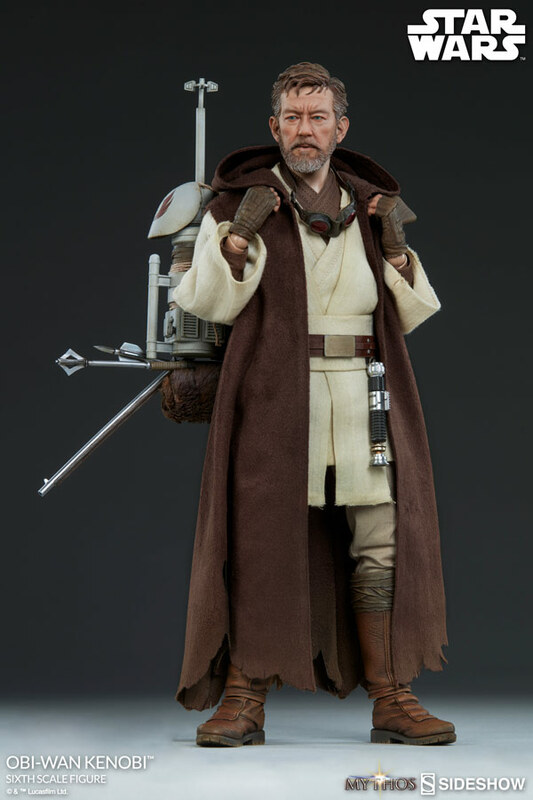 StarWars.com: Sideshow previously released a Mythos Obi-Wan statue, but this is the first time we’re getting this version of Obi-Wan in figure form. What inspiration did you take from the statue, and where did you make tweaks and improvements? Kevin Ellis: I’d say we stayed pretty true to the original statue. 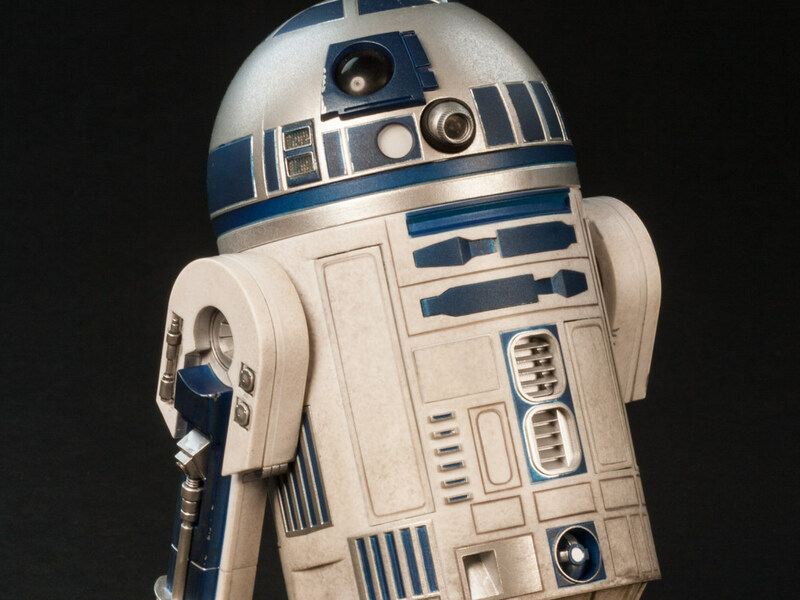 It became such an iconic Sideshow Star Wars piece, and the original design was so appreciated by the fans, it really didn’t need much in the way of improvement. 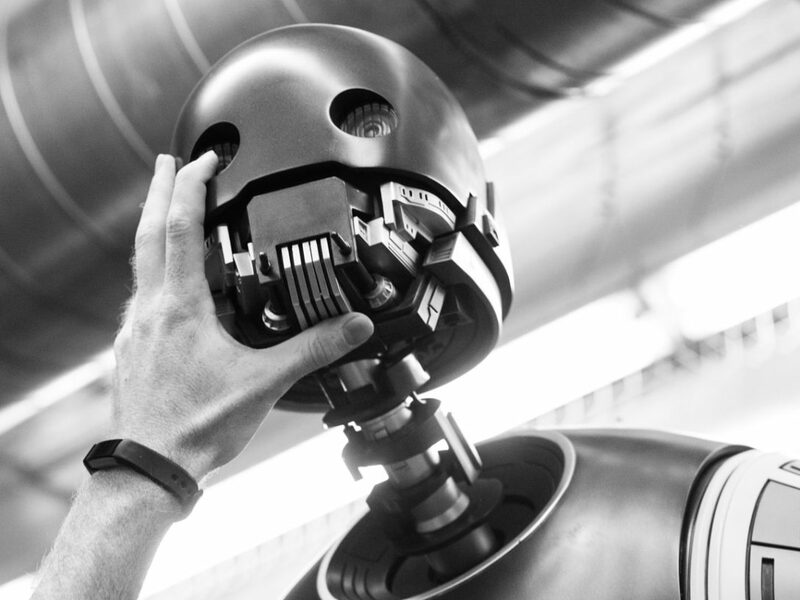 We had this unique opportunity, working with Lucasfilm to create a whole new moment in Obi-Wan’s life. There’s a huge responsibility there for us as artists, but also as fellow fans, to do that justice, and I think we did. 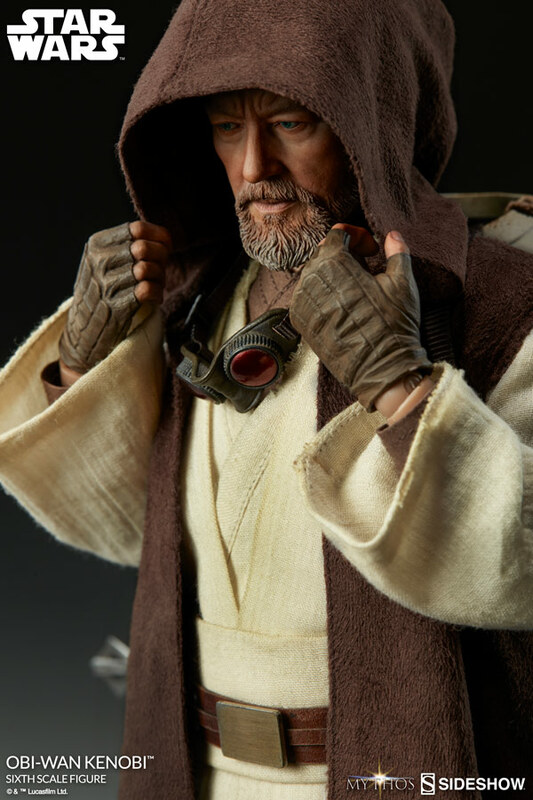 For the new, smaller, 1:6 scale Mythos Obi-Wan, we made a few tweaks to the design here and there, but the most significant change came with a different medium. You can actually get a lot more clarity and fine detail when you’re working with plastics, so you’ll see that we ramped up the details a lot. Even though this figure is smaller in scale, the level of detail is much, much higher. 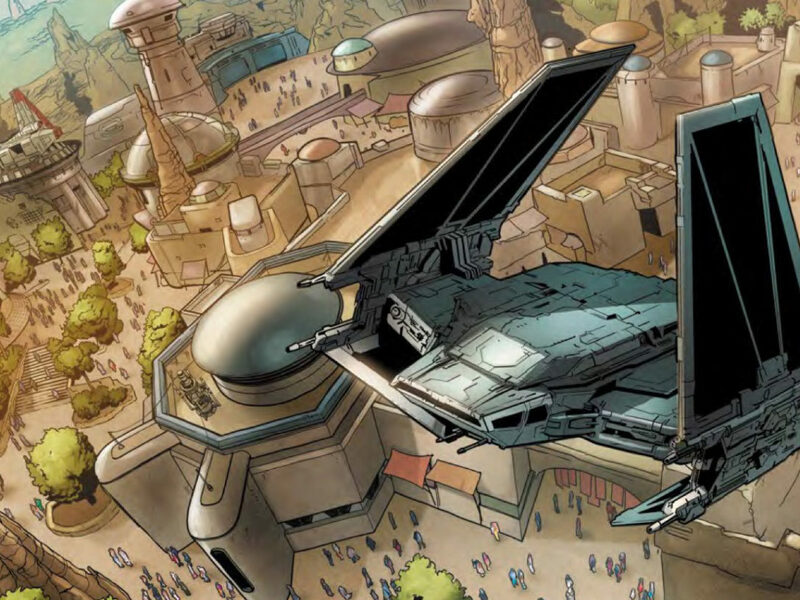 StarWars.com: The amount of detail is incredible. There’s yellowing on Obi-Wan’s Clone Wars armor, his leather backpack is weathered and worn, there’s even dirt in the ridges of his goggles. What kind of work goes into this level of realism? 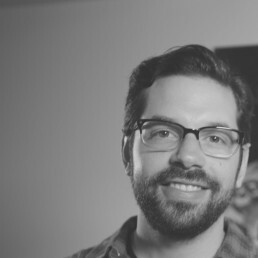 Kevin Ellis: I work with a great team of artists, who have an incredible eye for realism. I’m very proud of the team. With our Mythos line, we have the honor and privilege of telling our own small Star Wars stories in figure form, so we asked the same questions any storyteller would. 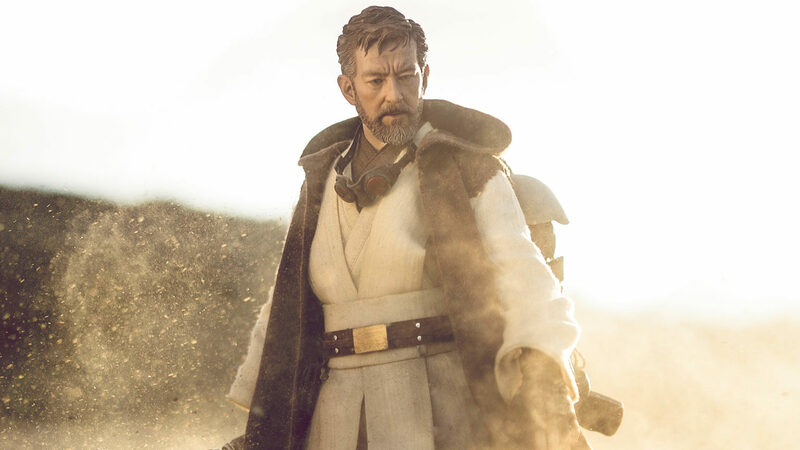 How long has Obi-Wan been on Tatooine at this point? When was the last time he wore his Clone Wars armor? Where did he get that backpack? What would he carry with him to each new adventure? Answering these questions then informs our design. 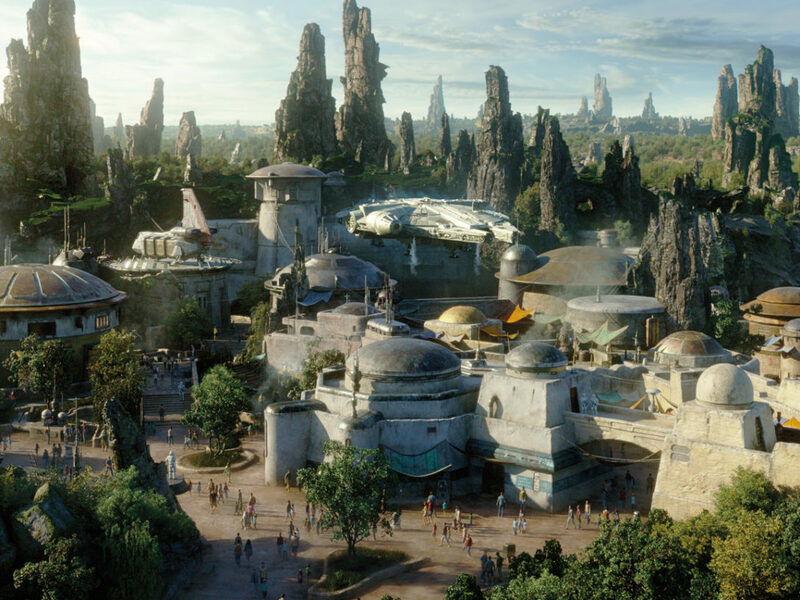 It’s storytelling on a micro scale, and we’re so proud that Lucasfilm once again gave us the opportunity to delve into their rich universe for inspiration. StarWars.com: Regarding the head sculpt, how did you go about capturing not just a young Alec Guinness, which you could conceivably do by looking at old films and photos, but capturing young Alec Guinness as Obi-Wan, which is much harder to do? Kevin Ellis: This was actually my favorite part of this piece, and your question is spot-on. We had originally started by focusing on young Alec Guinness. We gathered reference from many of his older films, as well as images from A New Hope and tried to blend the two together. As we progressed though, it became clear that approaching the likeness this way wasn’t reading as Obi Wan. It was a great likeness of young Alec Guinness, but younger Obi Wan doesn’t look like young Alec Guinness, he looks like Ewan McGregor! From there, it was about finding that balance between aging down Alec Guinness’s features from A New Hope, and adding in some of Ewan McGregor’s features from the end of Revenge of the Sith. It was a challenge, but I really think our sculptors did a great job finding that sweet spot. 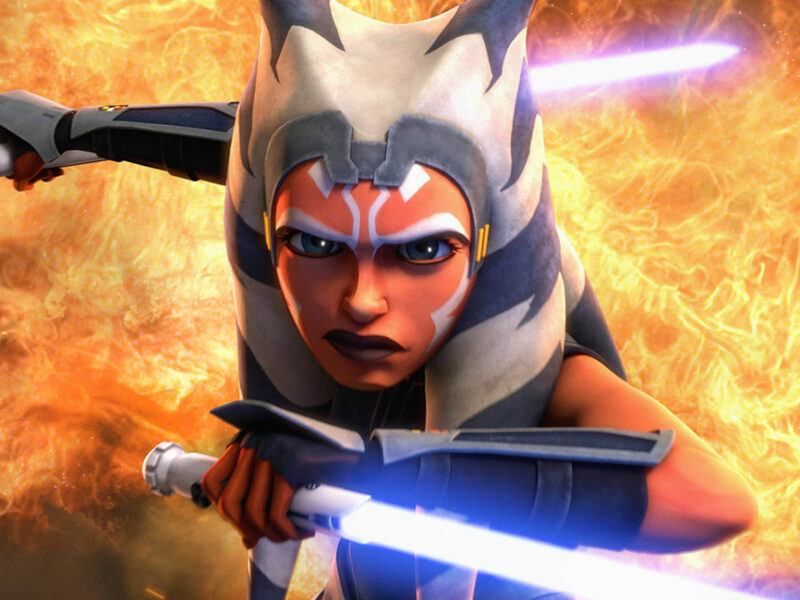 StarWars.com: Finally, what’s one small detail that fans might not notice immediately, but you love? Kevin Ellis: Curiously enough, this goes back to your question about some of the tweaks we did from the original statue. 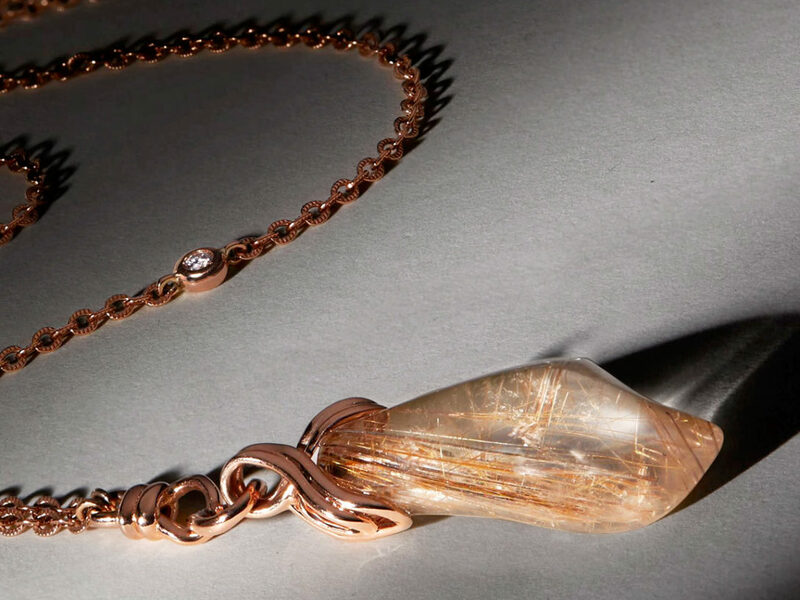 When we were getting ready to start working on the clothing for the piece, I really wanted there to be one more bridge between Obi-Wan the Jedi Master and Obi-Wan the desert nomad, something small that tied the character to both Revenge of the Sith and A New Hope. On the original statue, Obi-Wan’s belt was very much inspired by the belt he wore in Revenge of the Sith. 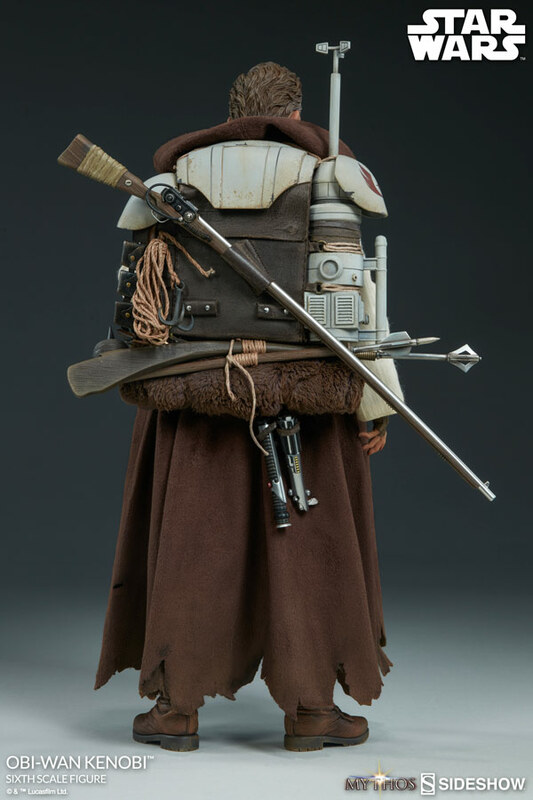 On our sixth-scale figure, we changed the buckle to the same one he has in A New Hope, and also added the small half-circle pouch that is seen hanging from his belt. They’re small details, but I’m a sucker for little nods like that. I think details like that invite people to ask their own questions and to create their own stories.